Andy H: There are a couple of Image issue #1s this week, including The Dying And The Dead, which is going to be worthy of a look as it's a Jonathan Hickman creator-owned book. But that's not where I'm going. Oh no, it's a second issue that I'm eagerly awaiting. 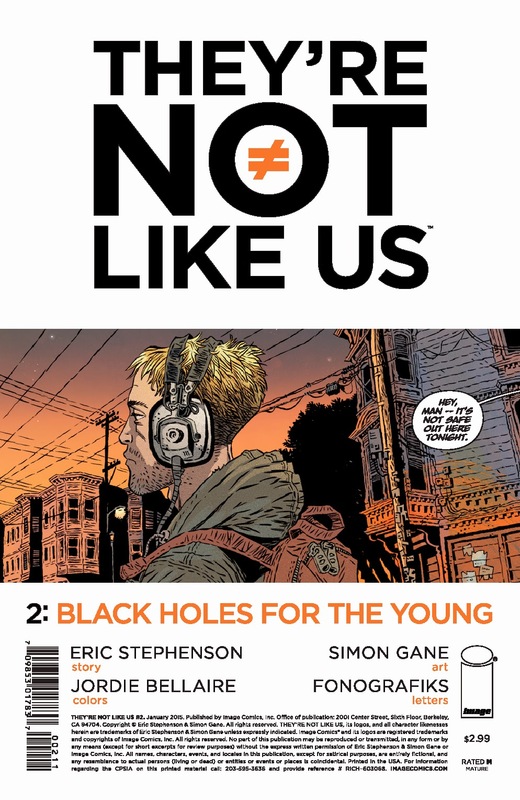 They're Not Like Us #1 really caught me off guard. The initial blurb didn't get it right so when I read it I wasn't expecting much and got a fantastic read for my money. Great ending to the first issue and I'm looking forward to where it will go from there. Another second issue but this time from a miniseries, Graveyard Shift #2. Written by Jay Faerber with some really nice art by Fran Bueno, this is the story of a cop who's girlfriend becomes a vampire and their search for a cure. A strong debut has got me coming back for more. Thor remains an enjoyable read; the action continues unabated as the new Thor learns to cope with the changes in her life. We still don't know who she (plenty of guesses!) but so far I'm enjoying the mystery. Avengers & X-Men: AXIS may not have set the comic world alight but the fallout could be interesting: Uncanny Avengers returns, with a #1, and makes it back on my pull-list for the time being. Tom P: A quiet week for me overall with only a few Marvel books on my shopping list. The first is New Avengers #29 from Jonathan Hickman and Kev Walker. I love the scope and ambition of this title and its sister book, Avengers; right from the start its always been a terrific read and at this point I will follow and have faith in it wherever it takes me, even if that is the end of the Marvel Universe as we know it! I like a shake up, so will happily watch them kick the bee hive. Next its Thor #4 and MR THOR vs. MISS THOR! Aaron's run with the God of Thunder has been mostly brilliant except for the sub-Lord Of The Rings crudfest that was appropriately named 'The Accursed' which appeared after the quite brilliant 'God Butcher' arc. Thankfully the newly relaunched series is full of energy and is both a real blast of fresh air and a whole lot of fun to boot. Long may she reign! So the only other thing I can think of is whether to try Uncanny Avengers #1 or not? I didn't get much out of AXIS but I dig the creative team and I expect I can forgive the much-hyped event as, to be honest, Remender's writing most of the best books available right now. Just on a side note, I see Image is reprinting the first trade of Criminal called Coward by Ed Brubaker and Sean Phillips -if you've never read it I can't recommend it highly enough as it's some of the finest crime fiction in comics.